Shirley Temple was the most famous child actor in history. From 1936-38, Temple earned more than any other Hollywood star, starring in films that offered an hour and a half of optimism at the height of the Depression. Her movies were credited with restoring the Fox studio to profitability when it had teetered near bankruptcy. Temple's mother had once had show business aspirations, and frequently played the phonograph and attended dance recitals while she was pregnant. Eight months after she was born, young Shirley was regularly swaying to music in her crib, and at three years of age she began taking dance lessons at Mrs. Meglin's Dance Studio in Los Angeles. She was discovered mere months later, when executives from a low-budget film company came by the dance studio. Temple began appearing in "Baby Burlesks", short films which spoofed popular movies by remaking them with children. In her earliest films, Temple performed remarkable impressions of such stars as Greta Garbo and Marlene Dietrich. While the cameras rolled, Temple's mother would be on the sidelines, encouraging Shirley to "Sparkle!" At 5, in 1934, she attained fame with a featured role in Stand Up and Cheer, starring Warner Baxter. Shirley starred in several more films the same year, including Little Miss Marker with Adolphe Menjou, Baby Take A Bow with Claire Trevor, and Bright Eyes with James Dunn, where she sang her classic "On the Good Ship Lollipop". The next year, she broke racial barriers by dancing with the original Mr. Bojangles, Bill Robinson, in The Little Colonel. Her family was protective, and her father, a banker, handled her finances, but even then, Hollywood was a ribald and raucous town. When she was seven, her insurance stipulated that it would not pay if she were injured or killed while intoxicated. When she was 11, Hollywood producer (The Wizard of Oz) and lyricist ("Singin' in the Rain") Arthur Freed exposed himself to Temple. In her autobiography, Child Star, Temple wrote, "Having thought of him as a producer rather than exhibitor, I sat bolt upright". She says she laughed at him and walked away, which infuriated him. To make her seem even more precocious, her mother subtracted a year from Temple's age, and until she was 13 Temple thought she had been born in 1929. As she lost her curls and began to grow curvy, she made fewer movies and, for the first time, attended a relatively normal albeit private school. She met her first husband, actor John Agar, who was the much older brother of a classmate, and they married when she was 17. Agar, however, was unable to handle being "Mr. Shirley Temple", and began to drink heavily. She continued appearing in adult roles, with diminishing box office success, and stopped acting after they divorced when she was 21. Temple fell in love a second time just months after the divorce, when she met pineapple executive Charles Black while on a vacation to Hawaii. She was especially charmed when he admitted having never seen any of her films. Temple called an old friend, FBI Director J. Edgar Hoover, and asked him to check into Black's background. Shortly thereafter, she became Shirley Temple Black. She briefly returned to acting in 1958, as host and sometimes performer of Shirley Temple's Storybook, an anthology series that ran on NBC and ABC from 1959-62. She began her second career in public life at about the same time, becoming involved in the fight against multiple sclerosis after the disease ravaged her brother George, Jr. She co-founded the International Federation of Multiple Sclerosis Societies. In 1967, Temple ran for Congress on a platform urging more American involvement in the war in Vietnam. She lost the election, and attributes this to political cartoons that showed the child Shirley Temple facing off against big grown-up politicians. She was 39 at the time. 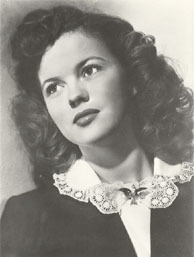 Shirley Temple Black remained active in Republican politics, and was named by Richard M. Nixon to serve as a US representative the United Nations. She was later an ambassador to Ghana. During the Ford administration, she was the first female Chief of Protocol for the White House, a position she did not enjoy -- one foreign dignitary's wife expected her to act as a hairstylist. She was later a Foreign Affairs officer for the State Department under Ronald Reagan, who had played her romantic interest in That Hagen Girl four decades earlier. Of her diplomatic posts, the strongly anti-communist Temple thought her most exciting position was as ambassador to Czechoslovakia, under George H.W. Bush. "I was told I was going to a Stalinist backwater, one of the toughest countries around... And I thought, 'Good! Let's go get 'em!'" While in Czechoslovakia, she once eluded the secret police and attended an anti-government rally, and then watched that nation's 1989 Velvet Revolution from a friend's apartment. "Shirley Temple doesn't hurt Shirley Temple Black", she once said. "Shirley Temple helps Shirley Temple Black because Shirley Temple is remembered with love and with affection. I am thought of as a friend -- which I am." Shirley and Charles Black were married for more than 50 years. She resided in California until her death. Hollywood Walk of Fame 1500 Vine St.